I don’t know about you…but I can’t wait for warmer weather! We are getting a tiny taste of it here and there lately and it’s definitely giving me Spring fever! One of the things I’ve been thinking about a lot lately is outdoor cooking! Which inevitably has me lamenting over the awful state of our BBQ grill! No really, it’s BAD! Last summer I bought myself a Weber Q100 Portable Gas Grill (pictured above). The hubster has a large pellet smoker and we have a large kettle charcoal grill, but neither of those are very useful when you want to grill something quick for dinner. This little Weber, however, is VERY handy to use….so we end up using it a LOT! My oldest son Erik, who lives in the basement apartment of our home with his lovely wife Kaitlyn, ALSO uses it, so it takes a beating! The last few times I cooked on it I’ve been more than a little disgusted and realized it was long overdue for a cleaning. I must warn you, this is not for the faint of heart! If you have a weak stomach, you may want to look away! I was going to try the same method I used on my stove burner pans (see Cleaning Those Nasty Stove Burners) which works amazingly well, but then I read somewhere that if your grill grate is small enough to fit in your oven, you can clean it by heating it to 500 degrees and “cooking” it for about an hour. It’s basically like putting it through your oven’s self-cleaning cycle. Since our grill is small I thought this sounded like a good idea. I put one of my old cookies sheets that my husband Dave uses in his smoker underneath the grill to catch any gunk that might fall through. One hour later it looked like this. Hmmmmmmmm….that didn’t look very encouraging! But looks can be deceiving, because as soon as it had cooled down enough to move it to the sink, almost all that burnt on crud had basically turned to ash and came right off with minimal brushing. After I had brushed the majority of the built up gunk off, I then scrubbed it with some Dawn dishwashing liquid to finish off the grease. How is this different from just leaving your gas grill on and letting the food burn off? I don’t know. I just know that I’ve tried that SEVERAL times and it never yielded these kinds of results. This is how it looked when I returned it to it’s home just an hour and a half later. This is brilliant! And I love the ideas in the comments too. I have lots of things to try now! Just a note, saying you are cleaning something “Without Chemicals” is untrue. If you are using water, you are using a chemical, dihydrogen monoxide. If you are using Dawn dish soap, you are using, in part: propylene glycol, cyclohexandiamine, polyacetate, and protease. There’s no getting around chemicals. They are the building blocks of everything. I understand what you mean, but the language isn’t correct. I personally find the foil method much easier & quicker. After you are done grilling place a sheet of foil shiny side down over the grates. I cover the grates completely. You don’t need to seal it down, just lay it on top. Turn the grill to high for about 15 minutes. Turn the grill and let it cool. 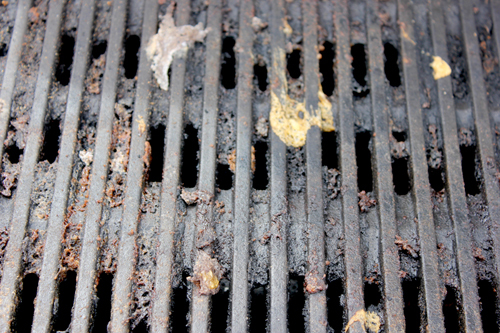 The ash just brushes off and you have a clean grill. I did this when I grilled pineapple that was coated in brown Sugar and cinnamon. I had a carmelized mess and once finished it was as clean as could be. I always look forward to your ideas and this one IS a good one, but I found one the other day on Dr Oz…cleaning your grill with a cut onion…saw it demo’d on the show and I works…just take an onion and slice in half …rub each cut half over your grill grates…works great!!! Chinese restaurants clean their wok by burning it over their high pressure stove until it’s red hot. Everything falls off it and it’s bright and shiny again. What do you think about putting the grill in the dish washer? I did that one time and it too forever to get the inside of the dishwasher clean. I will never do that again! so beware!! Thanks for the warning Jillian!! I have always been able to keep my grills clean by starting my gas grill or my charcoal grill and letting the grills heat up and brush the grills with my wire brush. Works every time. No soap or water just heat and brush. Another way is upon completion of bbq brush the grill with wire brush. Since I am a lttle OCD these methods work for me. Thank you for your tip, i may have to use it some day. Love all your Ideas. Great idea. I have to start with clean grill as well. If I smoked meat everyday, i would leave the grill alone to add flavor. Sounds like a great method Wretha!